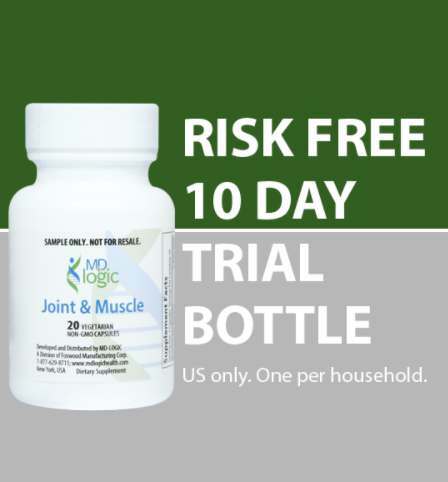 What makes MD Logic’s Joint & Muscle so effective? Human clinical trials have shown 40 mg of UC-II® undenatured type II collagen to be 200% more effective compared the traditional 1500 mg glucosamine/1200 mg chondroitin combination in promoting joint health. To aid in the benefits of UC-II®, our formulators have included several botanical extracts which utilize Phytosome® technology to optimize their absorption. Through clinical studies, both Turmeric and Boswellia extracts have been shown to have natural anti-inflammatory functions by acting on prostanoid synthesis (mPGE2s), protein degradation, transcription factors (Nf-kB) and decrease in c-reactive protein plasma concentration. Inflammation is the body’s natural defense against infection, but an excess of inflammation can lead to more free radicals. Free radicals are unstable molecules that damage or “oxidize” cells throughout the body in a process called oxidative stress. Over time, oxidative stress can leave our cells and tissues unable to function at peak efficiency, thus contributing to many age related health problems. By including Leucoselect® Grapeseed Phytosome®, MD Logic’s Joint and Muscle formula is able to support the reduction of inflammation-induced oxidative stress, as well as improve plasma antioxidant defenses. Find out more at MD Logic.